Ok. This is way more like it. I decided to whip up another batch of muffins. I couldn’t just let my baking failure stay with me all day long. Since I didn’t have anymore sour cream and didn’t want to make a trip to the store, I used this recipe instead of trying the other one again. A little healthy snack for those of you watching your calories at the start of the new year. Don’t we all have those 5 (cough!) – ok, 15 “Christmas cookie pounds” to lose? I certainly do. All my baking caught up with me this year. 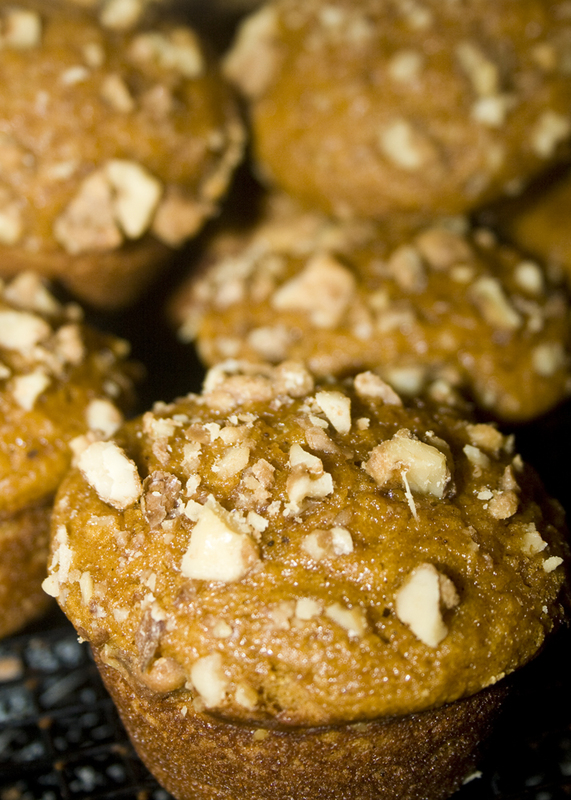 I modified this recipe so each muffin has a mere 100 calories – a perfect afternoon snack! And a terrific source of fiber. Did you know that women should be eating 25 grams of fiber daily? Men should be taking in 38 grams! Maybe let your guy have two of these muffins to help him along. They are moist and delicious – you wouldn’t even know how healthy they are if I didn’t tell you so. This recipe makes a TON of muffins – three dozen perfectly sized ones. Or, you can make three 9×5 inch loaves out of it. Great for sharing! I’m taking these to MOPS tomorrow. I did some plain, some with chocolate chips added and some with candied walnuts on top. You could also add raisins soaked in some rum if you like. Or cranberries. For each dozen muffins, you’ll need 1/2 cup of whatever you’re mixing in. As always with spiced breads, I round my measurements of spices. I took the original recipe and messed with it a bit. For starters, there is no oil or butter in my version – you will be AMAZED how fantastically moist these are using applesauce. Obviously if you put chocolate chips in, that decreases the “healthy factor” a bit, but still. No butter or oil? Superb! Also, I like the flavor of a mix of brown and white sugars much better than using all of one variety – but if you don’t have two cups of each, I’m sure these would still be great with mostly (or all) just one kind of sugar. In a large bowl, mix together the pumpkin, applesauce, sugars, and eggs. Combine the flour, baking powder, baking soda, salt, cinnamon, nutmeg, and cloves; stir into the pumpkin mixture until well blended. Add chocolate chips, raisins or anything else you’d like to add. Scoop batter into greased cupcake pans. Or divide the batter evenly between three 9×5 inch loaf pans that have been greased and floured. Top with candied walnuts if desired. If doing muffins, bake 20 minutes or until toothpick inserted comes out with just a couple of crumbs. For loaves, bake for 1 hour. The top of the loaf should spring back when lightly pressed. For muffins, cool 3 minutes in pans, then remove to a wire rack. For loaves, cool 10 minutes in pan, then slide a paring knife around the outside edge then remove to a cooling rack. Yesterday, my power was out the entire morning and most of the afternoon. It was very frustrating. I realized how completely addicted I am to my computer. When the power came back on, my monitor got fried and now won’t display anything. Computers are pretty worthless without a screen to show you what it’s doing. So, I’m typing on my little pink laptop – and having to stoop to non-RAW/unedited photos because this computer doesn’t have a program on it that can read RAW file format. Sigh. Woe is me. None of these issues however, can stop me from baking. And, amazingly enough, these muffins taste just as good without the fancy-pants photo. The shredded apple gives moisture and flavor to the entire muffin while the apple chunks add that extra “Oh! I’m eating an apple muffin!”. This recipe makes 12 normal sized muffins, or 6 jumbo/bakery style muffins. 1. Preheat oven to 375 degrees F (190 degrees C). Grease a 12 cup muffin pan, or use paper liners. 2. 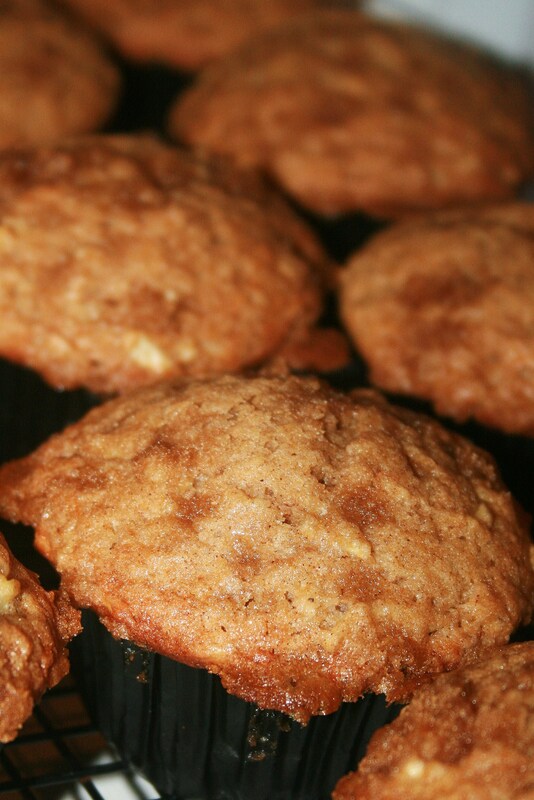 In a medium bowl, mix flour, baking powder, baking soda, cinnamon, nutmeg and salt. 3. In a large bowl, beat together butter, sugars, applesauce and eggs until smooth. Mix in vanilla. Stir in apples, and gradually blend in the flour mixture. Using an ice cream scoop, spoon the mixture into the prepared muffin pan. Batter will be thick like a cookie dough. 4. In a small bowl, mix brown sugar, flour and cinnamon. Cut in butter until mixture is like coarse crumbs. Sprinkle over tops of mixture in muffin pan. Depending on how much sweetness you like, you’ll either use about half the mixture (like me) or more to your taste. 5. Bake 20 minutes in the preheated oven, or until a toothpick inserted in the center of a muffin comes out clean. Allow to sit 5 minutes before removing muffins from pan. Cool on a wire rack.